This sign showcases mainly two types of people; the higher type who has command over their senses and the lower type who are jealous, rude and irreconcilable. 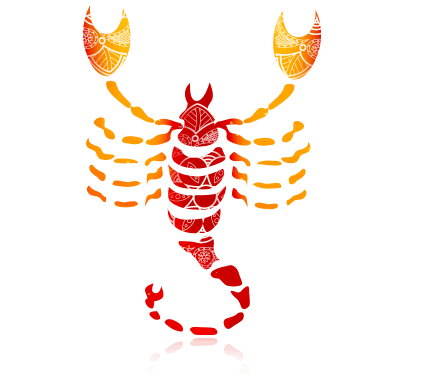 Scorpio sign is symbolized by “Keeta” which signifies reptile i.e. representing the poisonous Scorpio. Scorpions are quick, shrewd, quick, keen, critical, penetrating the mind with right judgment. They are self-reliant, bold and have conservative views. They have a subtle mind, difficult to influence, not easily imposed, energetic, courageous and sarcastic. They have a propensity to keep others under their control. They are seen to be good detectives and are fond of an investigation. They like to investigate mysteries. They are intense, have excited feelings, blessed with intuitive powers and are quite resourceful. They like to enjoy life at every phase; may be depressed or high. At times, they lose their temper very quickly and become irritated. They cannot stay idle and likes to remain engaged as much as possible. They don’t throw up when surrounded by obstacles instead they fight and win the situation. They are very rich and have a creative imagination. They are witty, blunt, determined, forceful and are fond of traveling. They are likely to suffer from diseases related to the pelvic bone, bladder, and the seminal vesicles. As their age progresses, they might get experience a stone in their bladder, brain affliction, insomnia, neuralgia, coma, somnambulism, and trance. They are golden in terms of wealth; lucky in speculations as well. They are usually blessed with a bunch of money, houses, vehicles and a good position in their career. They know very well, how to get money and how to spend it wisely. They are dynamic, intense and energetic when it comes to romance. For them, sympathy, right understanding, care, love and steady affection is very important to survive in any relationship. They are intolerant towards criticism. They ensure all the luxuries and solace for their partner. Their spouse is lucky, honest and sincere. They are loving, caring, likes to appreciate their wives time to time and are very concerned about their prestige. They have a short temperament, adjustable nature, and fine judgment. They are very intelligent, witty, loving, flexible and knows how to please their husbands. All they need is genuine affection and deep love for their partner. They are undoubtedly hard workers, honest and passionate. When they are misconstrued or not heard, they lose their temper easily. Virgo, Capricorn, Taurus, Cancer and Scorpio are best compatible with them. They induce a tendency to rule or being bossy over other people and are likely to be same at home as well. They are spendthrift, spend more than their income which causes troubles for them at times. They become successful as their age progresses. Overall, they spend a happy and meaningful life throughout. They go into professions like medicine, chemistry, research work, insurance, maternity departments, surgeons and can get into the government as well. They can become top officials in the government and can get into departments like C.I.D, Military and in the Navy. They should avoid being sarcastic, over critical, should hold their temper and should not be selfish. They carry that potential to create destruction in the society, to play the negative role in the society and can create anarchy. Drinking, revengeful nature and criticizing others should not be taken up by them. Monday, Tuesday, Thursday, Friday and Sunday are lucky days for them, whereas they should be careful on Wednesday and Saturday as these days might bring some disagreements. Tuesday is the day to fast to attain prosperity and destiny in the life. 1, 2, 3, 4, 7 & 9 numbers are lucky for them. Numbers like 5, 6 & 8 are not auspicious. Yellow, Cream, Red and Orange colors bring in luck and favor for them. Usage of White, Green and Blue colors should be kept off. Yellow Sapphire or Dark Red Coral made in the gold or copper should be worn on the 4th finger of the right hand on Tuesday morning after performing the ritual. When Mars is malefic, usage of Ruby or Red Coral plus Pearl made in the silver should be worn on the 1st or the 4th finger.